This data set provides hot pixel data, as an indicator of fires, that were detected by various satellites in the tri-national MAP region (Madre de Dios-Peru, Acre-Brazil, and Pando-Bolivia) in 2003, 2004, 2005, and 2006. Data from the following satellites/sensors were compiled: NOAA-12, NOAA-14, NOAA-15, and NOAA-16, which transports the AVHRR sensor; GOES-8 and GOES- 12, which transports the GOES Imager; and AQUA and TERRA, both which transport the MODIS sensor. These data were made available by the Centro de Previsão do Tempo e Estudos Climáticos (CPTEC) of the Instituto Nacional de Pesquisas Espaciais (INPE) via the internet (http://sigma.cptec.inpe.br/queimadas/). This data set contains 12 comma-delimited ASCII data files. Hot pixel data from satellites can be used as an indicator of fires and for the understanding of fire frequency in remote areas. The publication by Vasconcelos and Brown, 2007, which has been included as a companion file, describes the application of these data in the MAP region. In addition to the the hot pixel data, each observation has a derived vegetation type, susceptibility to fire, recent and past precipitation amounts, and a calculated fire risk value. These data are described in the Fire Risk Factor companion file, by Alberto W. Setzer and Raffi A. Sismanoglu, Version 5, February 2006. 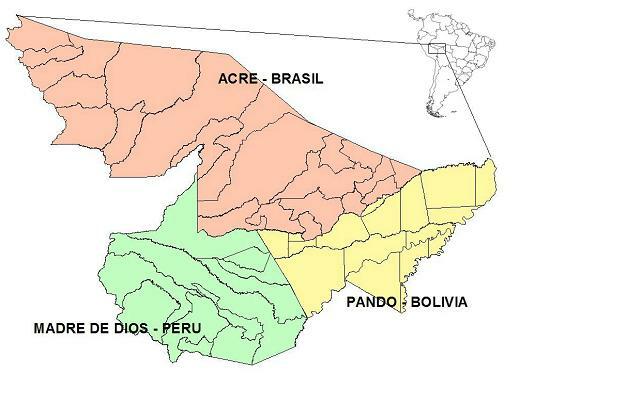 Figure 1: Region of Madre de Dios-Peru, Acre-Brazil, and Pando-Bolivia, called MAP region. This data set was archived in October of 2011. Users who download the data between October 2011 and September 2016 must comply with the LBA Data and Publication Policy. The investigators were Dobson, Myron Craig; Soares, Joao Vianei; Barros, Oton Osorio; Kellndorfer, Josef; Kobayashi, Tatsuharu; Lucas, Richard M.; Pan, Liang; Pierce, Leland E.; Santos, Joao Roberto dos; Ulaby, Fawwaz T.; Valeriano, Dalton De Morisson and Xie, Hua. You may contact Vasconcelos, Sumaia (sumaiasv@yahoo.com.br) and Brown, Foster (fbrown@whrc.org). The data for this data set are presented in 12 comma-delimited ASCII files: 4 files for each year included in the study (one file for each study area: Bolivia, Brazil, Peru). Each file gives the date, time and location for each detected hot pixel as well as the satellite image used. In addition, conditions including type of vegetation, days without rain, and fire risk factor are included for each pixel. For description of columns Veg_Class through Risk_Factor, see Fire Risk Factor companion file, by Alberto W. Setzer and Raffi A. Sismanoglu, Version 5, February 2006. Fire events vary in size. In areas such as Acre, where there is a large number of small rural producers in elongated properties of 150 m to 500 m in width, many simultaneous slash and burn fires of 1 to 5 ha can be clustered in one pixel of 1 km by 1 km (NOAA-12, AQUA, TERRA) or 4 km by 4 km (GOES-12), resulting in an underestimate of the number of burn events. On the other hand, in areas with large ranches, a single fire event can extend over dozens to hundreds of hectares and burn for days, being detected by many satellites simultaneously. Such large-area burns have been relatively infrequent in the MAP region. Data from the following satellites/sensors were compiled: NOAA-12, NOAA-14, NOAA-15, and NOAA-16, which transports the AVHRR sensor; GOES-8 and GOES- 12, which transports the GOES Imager; and AQUA and TERRA, both which transport the MODIS sensor. These data were made available by the Centro de Previsão do Tempo e Estudos Climáticos (CPTEC) of the Instituto Nacional de Pesquisas Espaciais (INPE) via the internet (http://sigma.cptec.inpe.br/queimadas/). The data on maximum temperature and minimum relative humidity at 1800 hours (UTC) at the surface are taken from the NCEP analysis done at CPTEC by the global scale model Global T213 at 62-km resolution. There is also the option of “kriging” data from meteorological stations for the entire area. Values for precipitation were obtained at a 4-km resolution from estimates of precipitation generated by DSA from satellite images from GOES-10 and MSG-2. We chose to use the estimates from satellite images since the density of climate stations is limited in various regions and this is the most important variable in the risk factor calculation. The map of vegetation types was adapted from the most recent mosaic Vegetation Index image of South America generated by DSA with AQUA MODIS images. 5 principle classes of vegetation were used: Closed wet forest, Open wet forest, Contato+ Campinarana, Seasonal Deciduous + Semi-deciduous and Not-forested. Predictions for RF for up to 3 days are generated from the products of regional ETA models at 20-km resolution and from the global scale model T213 at 62-km resolution. In addition the BRAMS models at two resolutions and ETA at 40-km resolution were also used in this research. Weekly forecasts for up to one month with a resolution of 40-km were also generated from the ETA model products. Pantoja, N.V. et al. 2005. Observacoes de queimadas no leste do Acre: subsidios para validacao de focos de calor derivados de dados de satelites. In: Simposio Brasileiro de Sensoriamento Remoto 12: 3215-3222. Goiana Anais, Selhorst, D. and I.F. Brown. 2004. Queimadas na Amazonia Sul-Ocidental, Estado do Acre-Brasil: Comparacao entre produtos de satelite (GOES-8 e NOAA-12) e observacoes de campo. In: Simposio Brasileiro de Sensoriamento Remoto 11: 3215-3222. Seltzer, Alberto, and Raffi Sismanoglu. Fire Risk Factor- Summary of the Calculation Method. DSA/CPTEC/INPE, Version 5, Feb 2006. Vasconcelos, S.S., I.F. Brown. 2007. The use of hot pixels as an indicator of fires in the MAP region: tendencies in recent years in Acre, Brazil. In: Simposio Brasileiro de Sensoriamento Remoto, 13. (SBSR), 21-26 abr. 2007, Florianopolis. Anais. Sao Jose dos Campos: INPE, 2005. Artigos, p. 4549-4556. CD-ROM. (http://marte.dpi.inpe.br/col/dpi.inpe.br/sbsr@80/2006/11.01.20.14/doc/4549-4556.pdf). Vasconcelos, S.S.; N. V. Pantoja; D. Selhorst; I.F. BROWN. 2005. Evolucao de focos de calor nos anos de 2003 e 2004 na regiao de Madre de Dios/Peru - Acre/Brasil - Pando/Bolivia (MAP): uma aplicacao regional do banco de dados INPE/IBAMA. In: Simposio Brasileiro de Sensoriamento Remoto, 12. (SBSR), 16-21 abr. 2005, Goiania. Anais. Sao Jose dos Campos: INPE, 2005. Artigos, p. 3411-3417. CD-ROM. I. F. Brown; S. S. Vasconcelos. As queimadas de 2005 e seu impacto nas florestas do Acre. Jornal Página 20, p. 20, 11/01/2006. I. F. Brown; E. M. N. P. Moulard; J. Nakamura; W. Schroeder; M. R. Maldonado; S. S. Vasconcelos; D. Selhorst. Relatorio preliminar do mapeamento de areas de risco para incendios no leste do Estado do Acre: Primeira aproximacao. 18 ago 06. Rio Branco: Ministerio Publico Federal do Acre, 2006.